Mulgrew mentions we have one snow day this year. Says it’s a likely school day. If we have more than one snow day we will extend the year. Mulgrew says let’s have some fun, plays Melissa McCarthy as Sean Spicer on video. We now have most unqualified ever Sec. of Ed. Goal was to make sure everyone knew who DeVos was. Thinks we’ve accomplished that. Thanks two Senators from NY. Says they want to be strategic and have a long few years, but will try to let people know who DeVos is. Says she’s helped us by showing who she is. We laugh, but it’s sad and terrifying. That we got two GOP to switch….says colleagues pushed. Senator from Alaska took 300K from DeVos and voted no. Says parents are beginning to think this is not good. Says she’s given word not to go after neighborhood schools, but President Numb Nuts and VP something won’t abide by it. We need to use this process to portray her as unqualified. We did that, and state two is Public School Proud. Mulgrew asks who attended Women’s March, many hands. Shows photos of placards at march. Shows photos of schools with Public School Proud, says hashtag popping up all over US. Shows tweets. Says we are working with locals all over US. Says they want to move forward with this. Says no matter what your political POV is that you want to protect public schools. Says we wanted to give people a positive message to run with. Asks for input on insignia. Black or white? Asks if we like pencil in insignia. One lined, one unlined. Shows designs for various groups. social workers, paraprofessionals. Says schools have contacted him about making videos, will send videographers if there are large enough groups. Speaks of showing love for public schools on Valentine’s Day. Says it is not one-day event, but rather long, tough campaign. Speaks of immigration, craziness, talk of safety from Trump. Likes that press is asking whether or not craziness is intended to distract. Says it isn’t fake news, but that’s he’s lying. Have not yet heard him say Trump’s name. For us, DeVos has paid dividends in NY. Only Flanagan supported her, but he also came out against constitutional convention. Mulgrew says one thing that would stop DeVos plans is anything about transparency. Says we will try to protect our state and city first, and focus on education. Says everything we believe in is on the line. Why are GOP against transparency for charters? Because of funders. Assembly has come out very strongly for complete funding of CFE, major expansion of millionaire tax. Says extension of millionaire tax will be tough, but we will need more revenue as we wait to see what feds do. If they mess with health care—he finally says President Trump—whether he likes it or not he is President. He says they aren’t repealing Obamacare so fast because they have no replacement. Says it’s done a lot of good to get people health care. Contract for Excellence—governor’s proposal wants to call it foundation aid, which has never been fully funded. Some ideas from Cuomo are good but we need other formula. Mulgrew will testify in Albany on Valentine’s Day. Says it’s not true NYC doesn’t fund schools and state is doing funding. Says this mayor has funded schools well. Constitutional Convention—we cannot lose this issue. Cites commercials favoring it, appealing to cleaner environment, ethics, women’s rights. New talking point is we are going to change constitution without convention, and that it’s faster. Legislature will vote on pension forfeiture for elected officials. It will pass and go to general vote in NY. Did we need convention for this? No. Do we need one for any of these issues? No. That is our strongest argument. Estimates 400 million cost for convention. 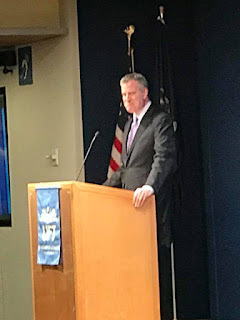 Mayor giving state of city address on Monday. Says he’s been positive on education. We still continue to struggle? Who likes their principal? More than normal, and that’s positive. Surveys for lukewarm and negative. Says we are seeing changes. From now on when principals says they’ll call legal, ask if it’s Karen Salamondo, who is now in labor relations. We have three grievances about paperwork and OPW we expect to win. Please let us know if it’s happening in your school. One school makes teachers teach during C6 assignment. We have to make sure we’re doing right thing at local school level. Use paperwork grievance as tool if it’s problem in your building. We like paperwork process. Over 150 schools resolved unreasonable mandates. We cannot stop being vigilant on this. C6 not teaching period. Even Bloomberg didn’t do it. Asks if anyone ever did cafe or hall duty. Says it used to be required. Says in 1995 it said we no longer had to clean up cafe or monitor halls. In return, we got C6. Is this happening elsewhere. Last but not least, Mulgrew was very proud at AFT Executive Committee last week. Says he presented Public School Proud, and that other locals adopted it. He said they lit up with things to go back to in their states. Says they didn’t want to ask for another petition against DeVos, but rather something else. Says he wishes he could film it so we could see what’s happening outside the city. Says we aren’t just fighting a governor or mayor, that these are really bad people, but we are nimble and move quickly. Says we will produce a storm of parents and teachers across country. Says this is the work that will make a difference. Says mayor is champion of public education, and to imagine Bloomberg and Klein under this scenario. Says Arne Duncan wasn’t that bad, and he’s surprised to be saying it. Says what you’ve done already is important, we’ve reached goal number one, we now have friends picketing Senators saying you are responsible for DeVos. Goal two is to spread this energy and bring it across US. Ends report 5:05. Staff Director Report Leroy Barr—UFT Black History film series, two more films, 13th on Monday, Rising from the Rails coming. Says discussion has been great. NYS Black and Puerto Rican Caucus on 18th. Paraprofessional awards March 18, deadline March 3rd. High schools future and focus March 9th for 10 and 11 grade students. Early childhood conference March 11th. Labor seder, March 28. School secretary luncheon May 6. Next DA March 22. CL—How can we involve members in endorsements? UFT controls city endorsements, NYSUT state, AFT national. Uses politically active teachers. Let political action department know. Exec. Board recommends to DA, DA decides. Delegate—Can we get buses to DC to welcome Betsy? I think we will wait to see what she does. Is she as good as Cathie Black? I wouldn’t let her speak publicly. If there is a need, we will go. Exec Board member—What happens when principals don’t want to deal with CL? You need intervention. If it rises up in DOE, they cannot sustain it’s a good idea. Contractual obligation to confer. If supe won’t stop action, will go from borough rep to central. Some CLs don’t want to deal with principal, feels that’s a disservice, lapse of responsibility. Says we have fun with that. CL—After many notifications about paras not doing lunch duty, principals still scheduling it. What are we doing to ensure that IEPs, notifications are kept. Principals were notified recently that principals have to arrange for paras to have duty free lunch. We sent it out again after supes reinterpreted it from last year. Said obligated didn’t mean we couldn’t do it. Paras may not be in lunchroom unless IEP calls for it. CL—Our acting president proposed national right to work law. How do we protect pensions, collective bargaining, dues checkoff? Unless there is a big shift…things can change…we will all be right to work sooner or later. Will it leave states to decide when 1975 decision is overturned? We have legal people and strategists thinking about it. 27 RTW states. NY and CA, MA union strongholds. Believes it will happen, and we have to organize. At AFT exec. committee, we help RTW states organize. Says elections matter. CL—Charters use space as leverage to get into buildings. Is there anything union is doing that’s similar? My school utilized at 186% and we aren’t co-located. We have portables. Is there an arbitration, and if not, how can we get more construction for schools that need it? Schools do not fall under OSHA regulations. Otherwise, would kick in, Mayor has upped school seats by 35k. We are winning argument as more people move to NY. Populations go up and down in neighborhoods. Will they build seats in right places? We will be part of process. We propose that if you aren’t transparent and accountable you can’t get free space—OR if you have assets of over one million—you should not have access. This is where DeVos is important. She did this in Michigan. Overcrowding destabilizes schools. Q—We do a lot of advertising. We have great art and music teachers and should have a marketing department to have jingles or commercials people will talk about, like Super Bowl commercials. Let’s market aggressively. Any progress on ESL teachers scoring? We've seen fake news under Reagan, was called misinformation. We want to move with public school proud. I would be good with jingle. For this month, not enough copies, on Chancellor’s letter on immigration. We need to take action now to protect our students and their families. Seconded. Voted down, after people on dais indicated they were against it. Mulgrew says we’ve passed more resolutions on this topic than anything but education. Dave Pecoraro—one line reso—resolved that UFT oppose Judge Gorsich and that senators filibuster against. Says seat was stolen, vacated during Obama admin, says he founded fascist club, ruled on Hobby Lobby. Carmen Alvarez—supports energy but says we must be judicious. We shouldn’t react, but we should build and keep momentum building our unity. Voted down. Mulgrew says he will reach out to AFT and Senators to see how they want to handle it. Mulgrew moves to do 2 and 3 first. So moved. City council endorsement—Paul Egan—special election Valentine’s Day. Recommend Bill Perkins, has been great for UFT. Mel Aaronson—recommends we endorse Tom Brown. We will vote on Constitutional Convention that could jeopardize retirement benefits. Wants someone to lead fight. Mulgrew forgets to hold vote, is called. Moves to go to number 4. Passes. Howard Schoor—Children we teach in danger of being deported. We want to make sure students safe from outside forces. Urges support. Hopes no speakers against. Mulgrew forgets to have us vote on resolution, is reminded. LeRoy Barr—speaks of mayoral endorsement. Says we decided to endorse Democrat, that GOP was largely against us, based on past 20 years. Said we needed to endorse now, as other unions have endorsed. Wanted UFT endorsement to mean something. Voted unanimously to endorse de Blasio. Said we remember where we came from, 20 years prior to his being mayor. Mentions years without contract. Said if you have to wait two or three years for retro you’re getting every dime. Mulgrew moves to allow committee members to speak. Passes. Antoinette Offucio—Says they looked at positives, all he did, preK, economy, 98% of all unionized contracts done fairly—ours ends in 2018. We looked at affordable housing. Standing against Trump in sanctuary city status, even if we lose money. Says de Blasio is a friend of unions, good for us. Grier Hanson Velasquez—After surviving Bloomberg and Giuliani, to be recognized and respected, valued—didn’t happen until de Blasio. Says he’s stood against charters with us. Feel it’s in our best interest to endorse now. Marjorie Stamberg—Says we absolutely do not need a Democrat, particularly de Blasio, Dems and GOP twin parties of capitalism. Trump is misogynist racist, pig. Democrats brought every imperialist war. Record of dems on deportation is 3 million. De Blasio has not supported us against charters, fell apart against Eva Presided over police acquittal in Eric Garner. We need our own worker’s party. LeRoy Barr takes chair—calls Mulgrew. Mulgrew— disagrees with speaker. Appreciates committee. Says it was bipartisan. Says it’s easy to forget what happened for two decades. This is someone whose soul and spirit is with us. We had horrendous battles. Mayor tried to do everything in venal way, and Giuliani crazier even than we thought, Bloomberg though education should be privatized. We fought him in streets. Big story was how de Blasio would settle contracts—settled with us first. PreK for all, literacy push, sound educational policies based on research. We survived, battled governor, our new friend. Have never had battle like this. Blessed to have this mayor who will stand with every single public school teacher. So many people don’t have that. He will get bad press from Post for this endorsement. Bill de Blasio has always said public education is key, and we must respect those who’ve dedicated lives to it. That’s why UFT should do this today, right now. He’s going to war, standing with us, as we go to war in United States. Point of order—James Eterno—says there should be speaker against. LeRoy Barr says Robert’s Rules say body may call and end debate. Says chair would be out of order if I called to end debate, but body may call. We want to be judicious and hear speaker against, there was a speaker for quite some time against. Body doesn’t choose who goes next, calls on Gregg Lundahl. Note: UFT leadership didn't follow Robert's Rules and allow Eterno to present his opinion, but you can see it right here. Mulgrew asks applause for Barr. Mulgrew says we are not adjourned. Bill de Blasio is here. Crowd chants four more years. De Blasio says he and his families have been to public schools. Talks about what it means to have teachers who help kids reach potential. Disgusted by political sport of denigrating teachers and unions. Says we saw it for years. Remembers tuning into conventions where denigrating teachers was part of program. Tolerated for years. No more. We’ve proved over last three years it’s morally right to respect teachers. We’re going to fight for soul of public education. You saw what happened in DC. We were teetering on brink until VP intervened. Will we commit to public education as a nation? Or are we going to slowly slice it apart, degrade and undermine it? That’s what’s at stake. Education matters more than ever. It determines destiny more than at any point in human history. If you want a middle class life, you’d better be educated. Public schools hold the key. How can we denigrate people who uplift our children. Public schools core of democratic society. I want to thank you for work that you do. 1% trying to destroy rights of working people. This union will fight that. Very proud of what’s happened, but proud to have joined you in creating pre-K for all. You had to do work to raise grad rate. Proud it’s highest ever, and we’re moving away from obsession with high stakes testing. We believe in multiple measures. But test scores go up as result of people in this room. We can innovate, we do teacher training because people deserve support. We need to support those who do this essential work. We achieved this together in contract. Those who’ve done work well should run the schools. We are proving how powerful this is, and how dangerous to our opponents that we keep achieving together. Opponents were sure it would go wrong. What did we do together? We’ve moved forward in ways they couldn’t even imagine. Now when you look to Washington, we will fight and look at NYC as proof positive. We are held accountable by public and parents. We keep performing and holding up. Some don’t want to be accountable. Some charters have been hoisted on own petard. But we all have one standard here. This debate in this country will be about that if we prove what traditional public schools can do for all. Everyone has to be inclusive. We don’t turn away handicapped or ELLs. No one here would kick a student out for not testing well. We believe in reaching those students We prove privatizers, anti-unionists wrong every day. Why don’t we keep succeeding together?